About this film review site | takilya ni leaflens - dakilang #filmmiron ever! Leaflens is Libay Linsangan Cantor offline. Dig it. She is always a literary writer, sometimes a TV scriptwriter, an on-and-off short documentary/narrative advocacy filmmaker, most times a photographer, a film school graduate, a reluctant showbiz/media practitioner, formerly a fabulous film school teacher, a one-time feminist media NGO worker, a past newspaper columnist, sometimes a lifestyle/entertainment publication features writer, formerly a freelance TV director, a tireless media (literacy) + gender (women’s/queer rights) + education (children’s rights) advocate/consultant/lecturer, forever a film buff, and a former heterosexual. She puts all of that in her film reviews. Don’t try to figure out how. She just does. 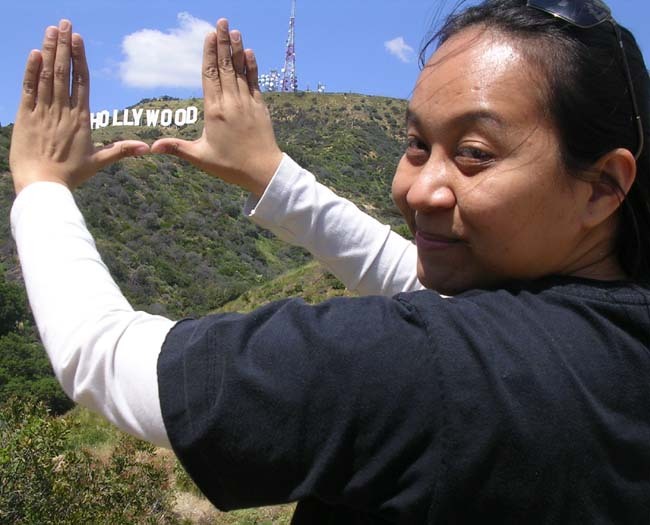 The site is her attempt to address a seeming lack of film criticism writing in the Philippines, her home country. While she will try to write about local films, she will just plainly write about films she sees whether local or foreign. SPOILER ALERT! She will not care about spoilers. Like she warns, read at your own risk. And feel free to comment, too. For the benefit of her sanity, she will try to avoid boring syntax-mangling uptight scholastic jargon type of writing; she will try to criticize films from a cineaste/film major/filmmaker’s point of view which academicians, film lovers and everyone else could enjoy. In short, yes, she could make films and yes, she could write and theorize about them, too. She believes Truffaut, Godard and his gang got that thing right, spot on. C’est la vie! Leaflens doesn’t study films mainly for the sake of studying films; she watches films because films are part and parcel of her life. Plus her mom and pop love watching movies as well. Also her other relatives. And her friends, too. Lalo na her gorgeous girlfriend. Every Filipino does. How about you? Once in a while, she will repost her previous mini-reviews of past films she saw here, which were originally published in her other blog or published in mainstream online and print publications. Once in a while, she will also tell you something about showbiz and film life and working in these industries… when she feels like it. Oh yeah, that header photo is her and one of the Philippines’ recognized National Artist for Film, the late great Ishmael Bernal. Go watch his films; they’re classics. Her take on pop culture and media stuff is at Culture Popper Leaflens. Her travel blog is at Leaflens Lamyerda. Yes, she loves blogging. Obvious ba teh? Kalurkey ‘pag di mo pa getlak ang chuva na ‘yan ha haller. Been blogging since 2001. Kaya mo ‘yon? Chos. You can reach her at libaylc@gmail.com or via mental telepathy depending on the geographic radius teh. You can follow her on Twitter as @Leaflens or @NewsMiron. Look for the hashtag #filmmiron or #newsmiron. You can ask her stuff at her AskFM leaflens tambayan. You can follow her on Instagram as @Leaflens. So by now, alam mo nang ‘pag may nagpakilala na siya ang leaflens, impostor ‘yan, ‘day. Pansinin mo lang k.